UPDATE: Water resources that could be affected by coal seam gas and large coal mining projects will now form part of environmental impact assessments under Commonwealth law. After lengthy debate on the "water trigger bill", the Senate on Wednesday passed changes to include water resources among the nationally-important environmental assets. The passage of the bill marks a major achievement for independent Tony Windsor and The Greens, while the Gillard Government had bowed to caucus pressure for the changes. In Question Time on Tuesday, Environment Minister Tony Burke said the bill would ensure "we take proper precautions with underground water and have a proper scientific approach" towards such resource projects. He said the independent scientific committee had already begun bio-regional assessments of water resources in the Galilee, Gloucester, Clarence and Namoi catchments. "What that then means is that, in the future, when different projects come forward, we have a much more fundamental understanding of the full range of connectivity issues beyond the specifics of the project that is in front of us," he said. "But to be able to take all of this into account is the final part of the three parts of the approach, and that is what was referred to in the question as a water trigger." Mr Burke said the "whole concept" of having the water trigger was because the state governments were not doing their job in relation to protecting water resources. The passage of the bill was welcomed by Mr Windsor, The Greens and Page MP Janelle Saffin, and supported by the Coalition. Mr Windsor, who was integral in the bill's introduction, said it was all about having a truly scientific assessment of what risks such projects may pose. He said some smaller project might have no impact, but if the government did not know what the effects could be, there was no way to prevent them. Ms Saffin said the North Coast of New South Wales still needed "more action, and it has to be at state level". She said the battle was far from over with "the Coalition vowing to undo the legislation, if they get an opportunity". A series of amendments by The Greens, to back-date the bill to apply to approved resource projects, include national parks under the act and allow farmers to "lock the gate" on mining companies, were voted down. Queensland Senator Larissa Waters moved three amendments, but said she believed passage of the changes was "futile", due to a lack of previous government and opposition support. Liberal Senator Simon Birmingham said the move did not respect due process and was an attempt to gag debate on the three amendments. He said despite his grave concerns about the way the debate was conducted, the Coalition ultimately supported the bill and its passage. A lengthy debate ensued, with Liberal Senator Ian MacDonald alleging Greens Leader Christine Milne insulted the Speaker and accused him of bias. But Senator Milne said, outside the chamber, she made no such statement, instead saying the Coalition had tried to filibuster the debate though "endless talk". The bill will become law once it receives Royal Assent from Governor-General Quentin Bryce. A COALITION attempt to give future federal governments the power to hand "water trigger" powers for coal seam gas projects back to states has been thwarted in the Senate. The bill to amend the Environmental Protection and Biodiversity Conservation Act, making water a trigger for Federal Government intervention in coal and CSG approvals, was still being debated in the Senate on Tuesday after two days of debate. 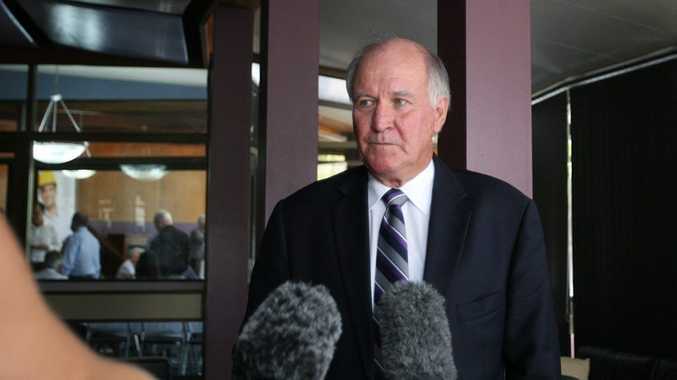 While the Coalition supports the water trigger, it opposes an amendment independent MP Tony Windsor attached to the bill in the lower house preventing the Commonwealth from handing decision-making powers back to the states. An amendment moved by Coalition Senator Simon Birmingham, that would have effectively knocked out Mr Windsor's amendment, was defeated 34-28 on Monday night. A host of Coalition senators rose to their feet to oppose Mr Windsor's amendment, arguing a regulatory impact statement was needed to examine its costs and effects on the CSG and coal industries. Coalition senators also claimed the move was unnecessary considering an independent scientific committee had been established to examine CSG and coal development applications. Senator Birmingham said the Windsor amendment would make it difficult for the Coalition to deliver on its promise, made in April last year, to make the states and territories a "one-stop shop" for environmental approvals. "The Coalition is gravely concerned by the government's decision to adopt measures and to support amendments that tie their hands and tie the hands of future governments if they want to improve the efficiency of the EPBC Act, if they want to ensure that the duplication that occurs in assessments and approvals at Commonwealth and state level is minimised as much as possible," Senator Birmingham said. "We think it is an outrage, to be frank, that the government have supported amendments that not only limit the use of these powers but fly in the face of what the government themselves had said they thought should be undertaken less than a year ago." The Greens failed in their attempt to have the water trigger extended to shale gas developments. Three remaining Greens' amendments, including one giving landholders the right to "lock out" CSG companies, were yet to be voted on. Greens Senator Larissa Waters said Labor's environmental credentials were on the line. "If Labor does not support these amendments, it will not have a shed of environmental legacy to leave before going to the election," Senator Waters said. "The Coalition are using every opportunity to filibuster on the bill, but Greens are determined to see the bill both passed and improved with our amendments." A final vote on the water trigger legislation was expected on last night.